Centre du Comptoir Unique Inc.
Before starting Centre du Comptoir en 1994, John Dekker had already completed one career as a manager of engineering projects in the pulp and paper industry. During this period, he had discovered that he liked working with his hands and that he was good at it. He had already started a sideline business designing and installing closet organizers. The closet business soon evolved into the more lucrative kitchen renovation business. When pulp and paper crashed in the late nineties Dekker went full time into kitchens renovations. Seeing a need for better organization in the countertop supply chain, Dekker started his own company selling countertops wholesale to other contractors as well as to the public. “Because of our volume purchasing we were able to offer good pricing to our customers – even being able to compete with the big box stores at the retail level” says Dekker. The company has grown steadily. Today Centre du Comptoir Unique carries a wide selection of quality countertops from custom moulded laminates to Corian, Staron, quartz and granite. They have been granted the Montreal exclusivity for the quality “Prémoulé” line of countertops and cabinet doors. Although a lot of their sales of countertops and doors are to other contractors, Unique still offers a full turn-key service from start to finish to homeowners – including measurement, estimates and installation. Centre du Comptoir Unique today is a family business. 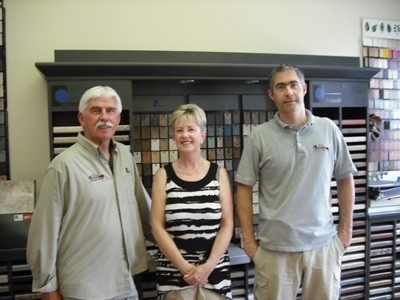 John’s wife Susan working in the office, and son Scott who is involved in all aspects of the business. “Scott is assuming more and more responsibility with the view of taking over the company when I eventually retire”, says Dekker.